Soak channa dal for an hour and grind it course with cumin seeds, 1 red chilli, turmeric powder, salt to taste. Place the paste in a bowl and steam it in pressure cooker for three whistles. You can also microwave it in medium temperature for 10 min. Allow it to cool. Meanwhile clean vazhathandu and cut it in small pieces. Heat oil in pan. 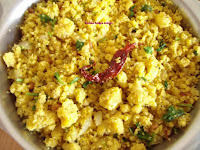 Spurt mustard, add urad dal. 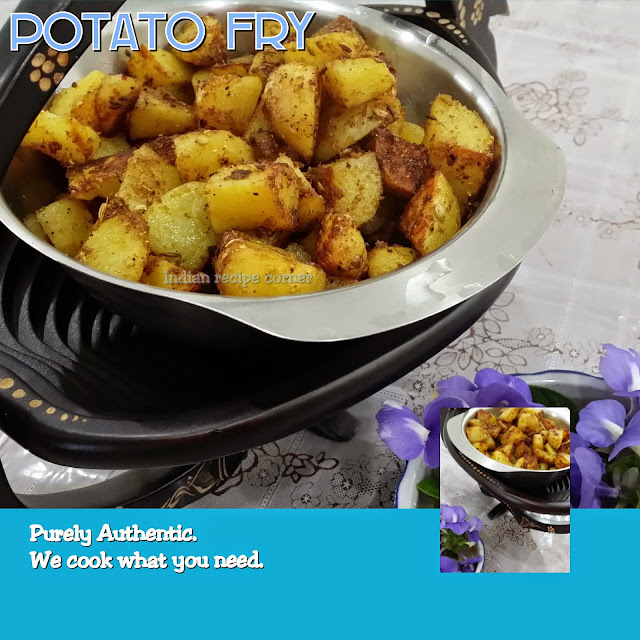 Fry till golden brown, add onion, asafoetida, 1 red chilli, vazhathandu, salt and a 1/4 spoon of turmeric powder. Close the lid. 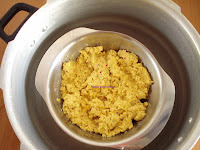 Now powder the paste in your hand itself and when vazhathandu is half cooked add this dal to it. Stir well and close the lid. Stir then and then. When cooked garnish with curry and corriander leaves. Serves great for rice with sambar and rasam.